My teaching palette. 20-colour Mijello palette. 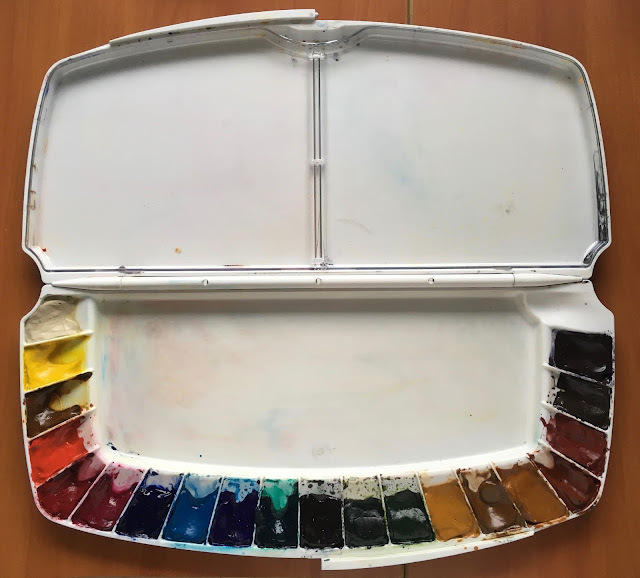 I really like the open-well style of palette rather than pans or half pans - they provide excellent brush access and plenty of space for the paint. This has three large mixing areas and you can remove the clear insert to clean it or to place it over a painting to check the colour match. The colours are Daniel Smith - here's a paint-out and explanation. The links are to my blog posts showing the colours in mixes. Buff Titanium - I use this all the time for urban sketching and for the subtle colours of some Australian natives. Quinacridone Gold - this is the PO49 but the new hue also works well - wonderful for a golden glow or for mixing gorgeous greens. Quinacridone Rose - another lovely primary option - this mixes clean purples and is a lovely rose. Undersea Green - a gorgeous neutralised green convenience mix. Great for landscapes and florals. Yellow Ochre - I love using this as an earth yellow in an earthy primary triad. Raw Sienna - lovely for skin tones and for the golden glow of sunsets. More transparent than yellow ochre. Burnt Sienna - a nuetralised earthy orange - excellend as a basic skin tone and for mixing a range of browns. Indian Red - the most opaque watercolour if used at full strength, this is also lovely in an earthy triad. Raw Umber - a deep cool brown - really excellent for leaf litter, urban sketching and trees. Jane's Grey - I don't make up palettes without my convenience mix of Burnt Sienna and Ultramarine. Great! *__* Why some people doesn't like this pallete? They say it's worse than 18 wells pallete. As I understand they both close well and... OMG, I wish I could buy all pallettes from Mijello, neither I don't need them and haven't any yet. It's way more economical to use halfpans and metal boxes for me as I don't know which colors are my favourite, so I can reorganize them all the time and try out new. But I dream for a good pallete to draw big pieces in wet technique, as you've said it seems more comfortable for big brushes. Thank you for your stellar website! Love the paint out photo, thank you again. I'm wondering if you've used a metal folding palette, such as the Holbein 250? They, too, have open wells. I know them and many of my students have used them but I haven't. They look functional though. My teaching palettes get thrown into a bag with a whole lot of other stuff so need to be robust! I have followed your blog for years. I have 2 questions driven by trying to decide on adding colors to my palette after taking Liz Steel's recent watercolor class. I used your original recommendations for palette colors years ago so I still have a small amount of the PO 49 version of Quin Gold, so I was looking at what to replace it with. 1. You recommend DS Quin Gold (newer version). How does it compare when using it in an actual painting to the old formula? I know that you usually recommend single pigment paints to keep things from getting muddy, especially for those new to watercolor. One criticism I read was that it was not as luminous of a color. This is hard to tell on a paint swatch. 2. DS Sap Green has also changed since it was made with PO49. If you didn't have the old formula Sap Green, what would your next choice be? I notice that you also like DaVinci and Sennieler. Looking at your swatches they look very different from DS. As a result of taking Liz's recent online watercolor class I considered getting a premixed green or mixing one with what I had like you did with Jane's Grey. So I thought I could just mix Phthalo Green PG7 and the original Quin Gold PO49, but that is when I discovered that the original is no longer made. I have done a alot of color mixing since Liz's class to determine the color mixes I would personally use the most. In order to do more plein air sketching and making it easier when doing it, I thought it made sense to get a premixed green or 2, then perhaps lighten it or darken it as needed. So this is what sent me down the rabbit hole. I also thought it might be a good choice for my cat's eyes. I was trying to be judicious in the purchase of more paint (trying to use what I have and not add something I really won't use.) I'm sure you know that comparing paint swatches without the knowledge of what the paint does is challenging. I now live in Wilmington, NC. It is described as coastal plains. We live near the Atlantic coast beaches. There are alot of long leaf pines, coastal grass, and of course sand. There are alot of shore birds as well. We have a retention pond and a forested area behind our house which backs up to our yard. While the "pond" is there for the purpose of rainwater runoff it remains full, so we have all matter of wildlife visiting. I worked on mixes with my current watercolors to determine what I might use given the option of things to sketch that I enjoy and are in my surroundings. I love sketching the wildlife and the surrounding landscapes. I also regularly sketch my (green eyed, buff/pale rust to gold) kitty. I'm sharing what I like to sketch and paint so that you might have a better idea of a recommendation. Thank you for you time and a wonderful blog! Pat there is a gorgeous glow to the PO49 Quin Gold that is just lovely. Nearly every 'hue' uses PY150 as a base. The problem with that is that it is a pigment that explodes on the page, so the hues will also tend to behave a little differently, with the yellow glow spreading. If you are using Liz' palette, (or my expanded palette) you may well have DS transparent red oxide - a stunning PR101 granulating burnt Sienna/burnt orange. You will also have hansa yellow medium. You can make your own lovely version of a quin gold hue with the hansa yellow medium with a little Transparent Red Oxide. Get it right so the undercolour is just warm, so it will take much more of the yellow and less of the red oxide. You can then use that mix to make your own greens. Yes they will be three pigment greens but they will be using colours already in your palette. You'd mix the first with a little phthalo green for a sap green and the second with ultramarine for a great undersea green. Jane, thank you so much for your thoughtful response. My original palette was based on your color suggestions for the 15 color palette. I have HYM, HYL, PG, UB & the original QG from DS. I had considered adding Transparent Red Oxide to my palette as it seemed more versatile after taking Liz's course. Your mixing suggestion sounds wonderful. Again, thank you so much! 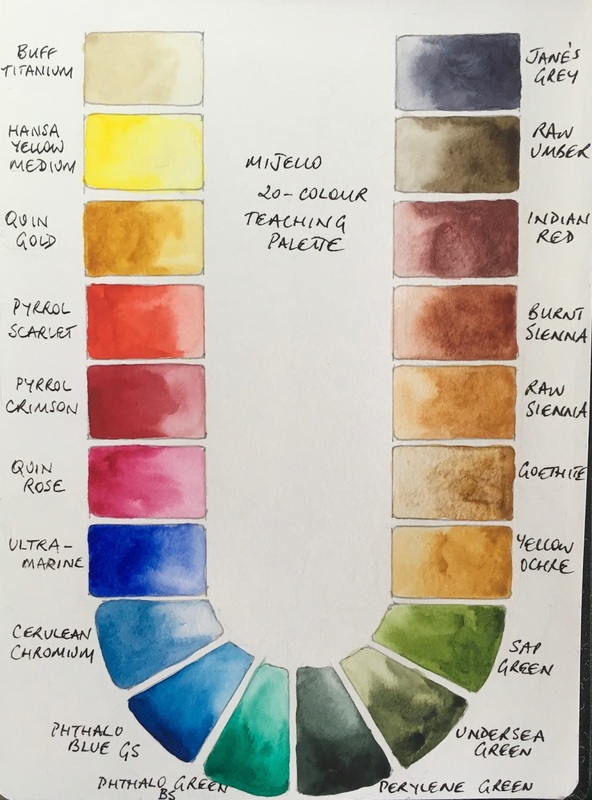 I based my 20 pigments on an older student recommendation of pigments on your site I guess, so I will have to look closely and see which colours have changed up. The new one sounds visually intriguing! Thanks Jane!